bracket to our product line. The Model A light is a Run/Stop with a clear window in the bottom to illuminate you license plate. 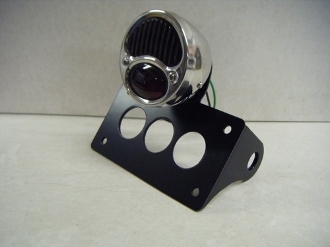 This is an EXTREMELY high quality STOP Model A light. The entire housing is POLISHED STAINLESS STEEL, not cheap chromed junk. The lens is REAL GLASS. These are as good as it gets! 1/2" is shock mount for Harley Sportster models!